Calendula Extract The extract of the Calendula Flower is commonly used to promote healthy breast tissue. It soothes and calms the sensitive tissue, while promoting blood flow. Aloe Vera Extract Extract of the Aloe Vera leaves, which soothes and heals the skin. It is deeply hydrating and moisturising and calming. Vegetable DNA This natural biopolymer which is extracted from wheat germ is capable of holding up to 10,000 times its weight in water, to provide deep hydration to the skin. A special process of purification is used to allow for the retention of its high and innate polymerization power. Vegetable DNA is rich in phosphates, which are slowly broken down by epidermal enzymes, to be absorbed into the skin’s channels to promote healing and cellular regeneration of micro damage. Highly antioxidant, this powerful ingredient protects and repairs skin which has been damaged by external pollutants, while inducing collagen and elastin production. It is highly soothing, moisturising and suitable even for the most sensitive of skin. Hyaluronic Acid A gel-like water holding molecule naturally found in almost every part of the body in the connective tissue. Hyaluronic Acid significantly improves skin hydration and moisture levels while stimulating the induction of collagen and elastin fibres. This antioxidant also has the ability to remove waste matter from the skin cells including where there is poor blood circulation. Hyaluronic Acid also retains over 1000 times its weight in water. Vitamin E This vitamin is very important for our skin and a powerful antioxidant which supplies essential lipids for moisture and nourishment. When we are exposed to UV rays from the sun, pollutants or other external factors, the body produces free radicals. Vitamin E, due to its antioxidant properties repairs the oxidised cells and protects against further damage. Vitamin E repairs the cells and protects the skin against further damage, while preventing dryness and rebuilding the skin’s barrier. Allantoin An emollient that treats and prevents skin dryness. It significantly improves skin texture, roughness and flaking while protecting against irritation. Directions: To be applied every day after bathing. Pat dry the skin, then follow by gently massaging Exel Bust Firming Lotion until completely absorbed, with upward strokes on the neck and décolletage. For the bust area apply support with one hand above the breast and use upward strokes with the other hand. We all know the how important oxygen is for the body to function. It is our primary source of energy, eliminating harmful free radicals, neutralising toxins and enhancing the body’s absorption of essential nutrients including vitamins, minerals, proteins and amino acids. Oxygen also has many benefits specifically for the skin. It removes skin aging free radicals, has an anti-inflammatory effect that reduces swelling, which is especially effective for sensitive skin and enhances the healing process. Oxygen is also antibacterial, adding the benefit of clearer skin. Why does our skin need more oxygen than from the air around us? Today, our environment has many more pollutants present and these external aggressors in turn affect our skin’s overall health. Free radicals from these pollutants penetrate the skin, causing our cells to become unstable (lacking an electron) leading to the spreading of free radical damage and skin aging. Our lifestyle choices (eg, smoking, drinking and caffeine) can also affect the condition of the skin and the way to promote healing and the elimination of toxins is through skin oxygenation. How do you induce skin oxygenation? Oxygen facials are a fantastic way to see the benefits of oxygen on the skin, but what do you do in between treatments, especially if you are unable to have facials as regularly as necessary? Topical application of Dry Extract of Live Yeast Cells (Yeast Saccharomyces cerevisiae Extract) can also oxygenate the skin, meaning you can continue having the benefits of oxygenation on a daily basis at home. 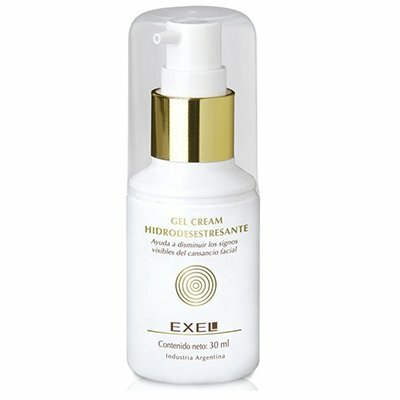 Exel Hydro-Destressant Gel Cream is formulated with Dry Extract of Live Yeast Cells which boosts “Oxygen Uptake”. This cosmetic property promotes oxygenation, cellular respiration as well as creating a metabolic process within the cells to stimulate collagen production. This extract is produced by Exel Biocosmetica from grown live yeast cells. The biological active components consist of peptides and glycoside fractions stemming from the proteolytic extraction of live yeast cells stimulated under the correct scientific conditions. Dry Extract of Live Yeast Cells is comprised of a complex mixture of proteins, sugars and amino acids. It is also an excellent humectant that conditions and moisturises the skin. It fights laxity and prevents premature aging while energising the epidermis. Superoxide dismutase is present in this extract. This enzyme is naturally found in all living cells to overpower the damaging reactions of superoxide, the most common free radical in the body. Another skin benefit of Live Yeast Cell Extract is its ability to reduce and prevent hyper-pigmentation by blocking melanin biosynthesis. 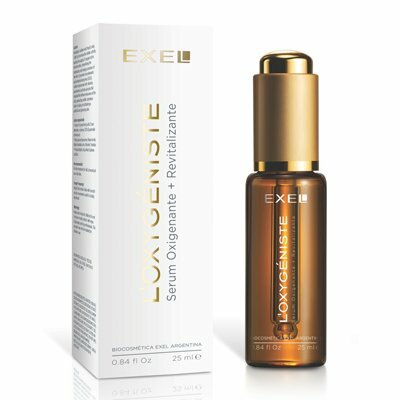 Exel Hydro-Destressant Gel Cream is also formulated with: Vitamin E Liposomes: A powerful antioxidant encapsulated in a liposome, a delivery system which allows the active ingredient to reach deeper layers of the skin, where they are able to and be dispersed to benefit targeted skin cells. Vitamin E repairs the cells and protects against further damage, while supplying the skin with essential moisture, preventing dryness. Allantoin: An emollient that treats and prevents skin dryness. It improved skin roughness and flaking while protecting against irritation. Beta-Carotene: An orange pigment found in plants, fruits and vegetables. Has antioxidant properties and can reduce the effects of sun damage by minimising pigmentation. Is a rich source of Vitamin A.
Jojoba-Oil: Extract from the seeds of the Jojoba plant. It is highly nourishing and repairs the skin’s barrier. Panthenol: Converts to Pantothenic Acid (Vitamin B5) when applied to the skin. Hydrates, moisturises and infuses water into the cells. Reduces skin irritation and stimulates healing. This Light textured gel cream revitalises, refreshes and energizes the skin. It is easily absorbed and promotes oxygenation. Improve the appearance of under eye dark circles and wrinkles. The exclusive mineral oil and anionic tensoactive free formula does not cause any skin irritation and is suitable for even the most sensitive skin. Directions: Daytime: After cleansing and balancing the skin with a toning lotion for your skin type, apply Hydro-Destressant Gel Cream to the face and neck with a gentle pressing motion until completely absorbed. Follow by applying sun protection. Night time: After cleansing and balancing the skin with a toning lotion for your skin type, apply hydro-destressant gel cream, by pressing into the face and neck. Looking for a way to improve the cellular metabolism and energize the eye area? Chlorophyll is another active ingredient which oxygenates the skin and improves the skin’s metabolism. Exel Eye Contour Gel is formulated with the antioxidant rich green pigment Chlorophyll, which is naturally found in plants and vegetables. Microspheres of Vitamin A and Vitamin E: Two powerful antioxidant vitamins are combined in tiny microspheres to disperse directly on to the eye contour. Vitamin A renews and regenerates the skin cell to boost collagen and elastin production, effectively treating and preventing wrinkles, while Vitamin E restores moisture levels, preventing dryness. Witch Hazel Extract: Reduces skin swelling, brightens the complexion and tightens the skin to prevent aging. Mallow Extract: Extracted from Mallow Leaf, it soothes and protects the skin, effectively reducing puffy eyes. Aloe Vera Gel: Hydrates and moisturises to soothe and heal dehydrated skin. Directions: After cleansing and toning, apply Exel Eye Contour Gel using a circular motion along the orbital bone until the microspheres are broken and the product is completely absorbed. Follow with the appropriate Exel serum and moisturiser for your skin. Just like the face, the body can suffer from loss of skin firmness and elasticity. This commonly affects the arms, abdomen, back and thighs. Loose, sagging skin can occur when the skin becomes stretched, such as after dramatic weight loss or pregnancy. It can also occur with ageing caused by the breakdown of collagen and elastin fibres. To tighten and firm the skin Exel Body Lab formulated skin firming products specific for the body to restructure the skin by inducing collagen synthesis and cellular renewal. A spray on lotion that promotes firming, collagen production and elasticity, while deeply moisturing and softening the skin over the entire body. Opens the skin’s channels to further the penetration of Exel Body Firming Cream and has an astringent effect to tighten the skin’s surface. Formulated with Hydrolysed Silk Proteins, also called serecin, which help to stimulate cellular renewal, firm and tone the skin, while providing deep hydration and antioxidants for repair. Additionally, it contains Centella Asiatica extract, a powerful herb with healing properties which has been proven to activate the production of collagen, by encouraging the growth of fibroblasts, the cells responsible for collagen synthesis. It also improves stretch marks and cellulite appearance, strengthens venous walls and improves blood circulation. Yerba Mate extract, a plant often consumed as a tea infusion, is rich in polyphenols and xanthine, which combats free radical damage with antioxidant properties, while preventing the degeneration and hardening of collagen fibres. Use on areas of skin laxity with visible sagging or loss of firmness. The lotion is perfect on arms, back folds, the abdomen and thighs. Thoroughly cleanse the skin and exfoliate with a mitt or loofah 2 times a week. On a daily basis, spray Exel Body Firming Lotion and gently massage into the skin until it completely vanishes. 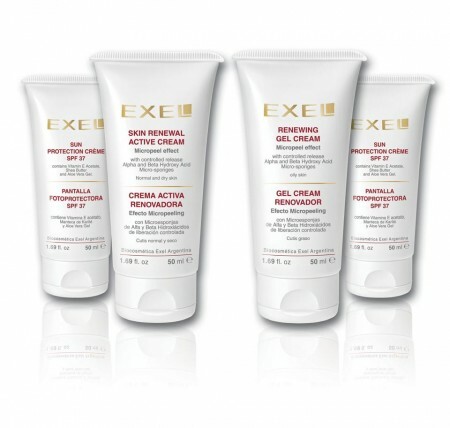 Follow by applying Exel Body Firming Cream and massage into the body until fully absorbed. Strengthens and tones the skin over the entire body by helping to increase elasticity while preventing the formation of stretch marks. Provides a firming effect by stimulating collagen production and deeply moisturises the skin to improve the condition of the whole body. Exel Body Firming Cream helps to slow the ageing process with the antioxidant and repairing properties of Vitamin E, a powerful moisturising ingredient that also prevents and reverses free radical cellular damage. Phospholipids of Soybean Lecithin: Phospholipids are a class of lipids that are a major component of all cell membranes, as they form lipid bilayers. Soybeans contain phytoestrogen, which is a plant derived compound with estrogenic activity. The result is a boost in collagen production and firmness while brightening the skin. It attracts and holds moisture to the skin. Alpha Hydroxy Acids, derived from plant and milk sources accelerate the skin’s natural exfoliation process, to result in increased cell turnover, a smooth, even texture while gently improving pigmentation over continued use. These include Glycolic (sugar cane), Lactic (sour milk), Citric (citrus fruits), Malic (apples) and Tartaric (grape wine) acids. Hydrolysed wheat germ protein is an extract of the most nutritious part of the wheat kernel, containing Vitamin E which moisturises and protects, Vitamin K for speeding up skin healing and reducing inflammation, Palmitic acid for helping the production of natural oils in the skin and Phytosterols, a plant steroid that stimulates the production of collagen and a number of other nutrients. Grape Seed Extract, a powerful antioxidant not only fights free radical damage but is rich in flavonoids which protect the skin cells from damage. Grape seed extract inhibits the destruction of collagen structures in the skin and strengthens blood vessels. Citrus limonum extract, which comes from lemon peel, clarifies the skin and has antioxidant skin repairing properties. Malt extract is derived from barley, which contains selenium for preserving skin elasticity and has antioxidant properties. Malt extract promotes skin firming, and promotes the flushing of toxins from the body. Use on areas of flaccid skin with visible sagging or loss of firmness. The lotion is perfect on arms, back folds, the abdomen and thighs. Thoroughly cleanse the skin and exfoliate with a mitt or loofah 2 times a week. On a daily basis, spray Exel Body Firming Lotion and gently press into the skin until it completely vanishes. Follow by applying Exel Body Firming Cream and massage into the body until fully absorbed. Want to have the Ultimate in Body Firming and Skin Tightening? Contact Exclusively Beauty on 9821 3300 for a FREE CONSULTATION for treatments to look your best. The skin around the eye contour is thinner and more fragile than the rest of the face and is the first place to show signs of ageing, which is why it requires skincare products specifically formulated for this delicate area. To prevent and treat premature ageing, Exel Skincare has a range of Eye Care Products designed to improve the skin’s elasticity and bring deep hydration for firmer, younger looking skin. 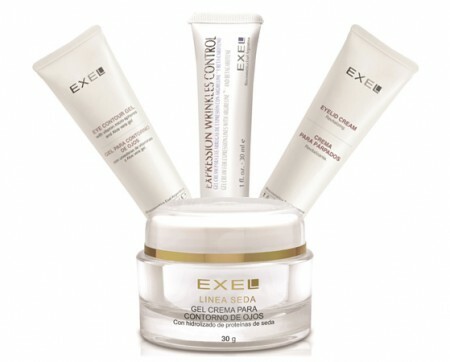 With Exel Skincare Professional Beauty Products you will achieve visible results and improvements for your skin. A refreshing gel with vitamin microspheres and Aloe Vera gel delivers intense hydration while helping to strengthen and improve skin elasticity. Brightens and restores essential hydration to the eye contour. Helps to prevent and reduce puffiness and dark circles. Aloe Vera gel which has a hydrating and soothing effect on the skin. Mallow Extract for reducing puffiness due to its anti-inflammatory properties. Witch Hazel Extract which brightens the eye area and helps tighten the delicate skin of the eye contour. Vitamin Microspheres containing powerful antioxidants Vitamin A and E. The microspheres are broken as they are gently massaged into the eye area, allowing the vitamins to be dispersed, delivering the antioxidants to repair and protect skin cells. Vitamin A improves the cell renewal process and Vitamin E increases the moisture content of the skin. After thoroughly cleansing and applying an Exel Lotion spray suitable for you skin type, apply Exel Eye Contour Gel using a patting motion along the orbital bone until the microspheres are broken and the product is completely absorbed. Follow with the appropriate Exel Serum and Moisturiser for your skin. Emollient, anti-oxidant rich cream with Mallow, Chamomile and Ginko Biloba Extracts revitalises the eye area. Moisturises and strengthens the skin while relieving puffiness. Ideal for treatment against flaccidity and dryness in the eye contour area. Hydrolysed Wheat germ, extracted from the most nutritious component of the wheat kernel, containing Vitamin E which moisturises and protects, Vitamin K for speeding up skin healing and reducing inflammation, Palmitic acid which helps the production of natural oils in the skin, Phytosterols, a plant steroid that stimulates the production of collagen and a number of other nutrients. Purified phospholipids from soybean lecithin, a lipid-protein complex that forms the cell membrane, extracted from soybeans. Soybeans contain phytoestrogens including isoflavones, which are a plant derived compound with estrogenic activity. This results in brighter skin with a decrease in redness while boosting collagen production. It also has the ability to attract water and moisturise the skin. Mallow Extract which reduces puffy eyes due to its anti-inflammatory properties. Chamomile Extract which soothes irritation, reduces inflammation and softens the skin. Ginko Biloba extract, an antioxidant herbal extract which protects the skin from redness and inflammation due to it being a rich source of flavonoids. It is capable of increasing the skin’s moisture content and has antibacterial properties. Vitamin E, an antioxidant that improves the texture and moisture content of the skin. After thoroughly cleansing and applying an Exel Lotion spray suitable for your skin type, apply Exel Revitalising Eye Cream using a patting motion along the orbital bone until product is completely absorbed. Follow with the appropriate Exel Serum and Moisturiser for your skin. Cream Gel with a gentle and smooth texture that moisturises, revitalises and helps minimise the appearance of fine lines around the eye area. Contains hydrolysed proteins from silk cocoons which have a firming action on the skin while adding silkiness and reducing puffiness. Vegetable extracts help to improve the appearance of dark circles and bags under the eyes, providing more radiant and youthful skin. Hydrolysed Silk Cocoon Proteins, also known as sericin, are rich in antioxidants and firm while giving a silky texture and radiance. It is naturally hygroscopic and is excellent for moisturising and conditioning the skin. Witch Hazel Extract for brightening and tightening the eye contour. Mallow Extract has an anti-inflammatory action and reduces puffiness in the eye area. Calendula, a flower with antibacterial and immunostimulant properties. It has the ability to brighten and protect the skin against pigmentation, creating an even skin tone. Chamomile Extract soothes irritation, reduces inflammation and softens the skin. Aloe Vera Extract improves skin hydration and has a calming effect on the skin. Jojoba Oil is extracted from the seeds of the Jojoba plant. It is highly nourishing and repairs the skin’s barrier. Purified phospholipids from soybean lecithin, are a lipid-protein complex that forms the cell membrane, extracted from soybeans. Soybeans contain phytoestrogens including isoflavones, which are a plant derived compound with estrogenic activity. This results in brighter skin with a decrease in redness while boosting collagen production. It also has the ability to attract water and moisturise the skin. Shea Butter is an extract from the nut of the Shea Tree which prevents water loss, while softening and soothing the skin. Bisabolol, an extract derived from Chamomile which enhances skin hydration by reducing dryness and flaking. It restores suppleness to the skin, accelerates the healing process and has anti-irritating, anti-inflammatory and antioxidant properties. Vitamin E, a powerful antioxidant that improves skin texture and moisture levels. Beta-carotene which has antioxidant properties and can reduce the effects of sun damage. After thoroughly cleansing and applying an Exel Lotion spray suitable for you skin type, apply Exel Eye Contour Gel Cream with Hydrolysed Silk Proteins using a patting motion along the orbital bone until the product is completely absorbed. Follow with the appropriate Exel Serum and Moisturiser for your skin. A super-moisturising gel cream of a unique light texture that is absorbed instantly and completely, it refreshes the skin, making it appear well rested and hydrated. 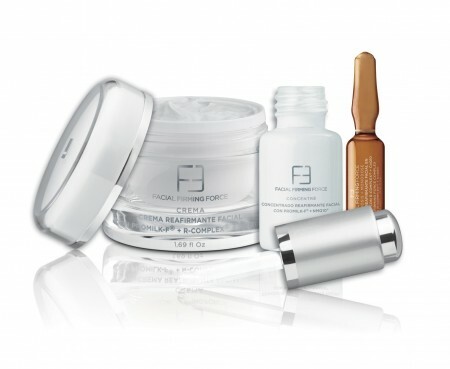 The non-irritating formula helps minimise fine lines and expression wrinkles. Improves skin tone and elasticity for the face and eye area. It allows the resting of muscle contraction used for facial expressions, providing a similar effect to botox. Argireline (acetyl-hexapeptide 3), a peptide with a derma-relaxing action that induces resting of muscle contractions. It has a similar effect to Botox. Allantoin, an emollient that treats and prevents skin dryness. It improves skin roughness and flaking while protecting against irritation. After thoroughly cleansing and applying an Exel Lotion spray suitable for you skin type, apply Exel Gel Cream for Expression Wrinkles using a patting motion along the orbital bone until the product is completely absorbed. Follow with the appropriate Exel Serum and Moisturiser for your skin. Not sure of which product is best for you? Contact us on 9821 3300 for a FREE CONSULTATION for in depth professional advice.